Read and understand the ingredients on product labels. 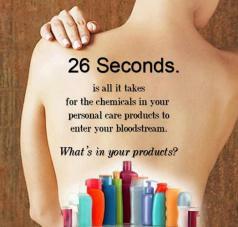 Did you know up to 80% of what is applied to the skin is absorbed into the bloodstream? Hopefully that will make people take a second look and be more cautions as to what products they use. However, sadly enough for many the skin is an afterthought. Although skin is the body's largest organ, it is not treated with the same level of respect compared smaller organs such as the heart. • 60% of sunscreens contain the potential hormone disruptor oxybenzone that readily penetrates the skin and contaminates the bodies of 97% of Americans. • Surveys show that on average women use 12 products containing 168 ingredients every day, men use 6 products with 85 ingredients, and children are exposed to an average of 61 ingredients daily. The large majority of these chemicals have not been assessed for safety by the industry-funded CIR (Cosmetic Ingredient Review) safety panel. • An investigation of more than 1,700 children’s body care products found that 81 percent of those labeled “gentle” or “hypoallergenic” contained allergens or skin and eye irritants. If you use all of these products every single day for a year, you are exposed to over 35 pounds of chemicals. Of course, many of these products are mainly water so if you subtract out the water, your non-water chemical exposure is about 5 pounds in a year. Parabens: preservatives used in lotions, shampoo and other cosmetics. 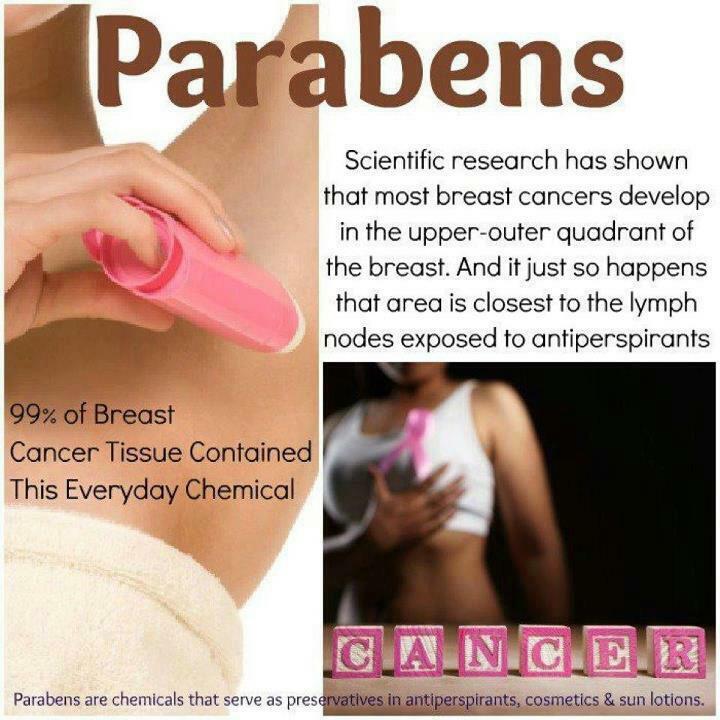 Some parabens are classified as endocrine disruptors because they mimic estrogen in the body. Higher estrogen exposures are linked to higher risk of breast cancer. Aluminum: a study published in 2003 by the European Journal of Cancer Prevention, found a correlation between earlier diagnosis of breast cancer and antiperspirant/deodorant use. A 2003 study indicated "underarm shaving with antiperspirant/deodorant use may play a role in breast cancer. 2004 and 2005 studies led by researcher Philippa Darbre, hypothesizes that particular substances in deodorants, such as preservatives called parabens, or bolts such as aluminum chloride used in antiperspirants, get into the bloodstream or accumulate in breast tissue, where they enhance or emulate the effects of estrogen, which stimulates the growth of cancerous breast cells. A 2007 study found that personal care products are a potential contributor to the body burden of aluminum and newer evidence has linked breast cancer with aluminum-based antiperspirants. Phthalates: plasticizers found in nail polish, synthetic fragrance and plastic packaging. These hormone-disrupting chemicals have been linked to early puberty in girls, a risk factor for later-life breast cancer. Some phthalates also act as weak estrogens in cell culture systems. Fragrance: secret mixtures of chemicals used in both perfumes and scented cosmetics. "Fragrance" may include phthalates, synthetic musks (which may disrupt hormones) and ethylene oxide (a mammary carcinogen). The companies are not required to list these chemicals on product labels. Nonylphenols: used in some cleansers. They have been shown to disrupt hormones. Sunscreen chemicals: some behave like estrogens and have been shown to make some breast cancer cells proliferate. Isobutane: a propellant used in spray-on hair spray, gel, mousse, shaving cream and anti-fungal treatment. It can be contaminated with 1,3-butadiene, a probable human carcinogen and a mammary carcinogen. Ethoxylated compounds: dimethicone, PEG-40, ceteareth-12 and other compounds with the syllables “eth” or “PEG” in them are used in a wide variety of cosmetics. These compounds are formed by processing with ethylene oxide, a mammary carcinogen, and can be contaminated with 1,4-dioxane, also a mammary carcinogen. Metals: found in a variety of cosmetics as colorants, sunscreens or contaminants. Iron, nickel, chromium, zinc, cadmium, mercury and lead have been found in higher levels in women with breast cancer than in women without breast cancer. Nickel, chromium, cadmium, mercury, lead, copper, cobalt and tin also have estrogenic effects on breast cancer cells in the lab. Petrolatum: a derivative of petroleum used in lip products and lotions. It can be contaminated with polyaromatic hydrocarbons (PAHs), which are both endocrine disruptors and carcinogens. Toluene: used in some nail products. Can be contaminated with benzene, a known carcinogen. Triclosan: commonly used in anti-microbial soaps. More research is needed to understand how triclosan relates to breast cancer, but evidence suggests it affects male and female hormones as well as thyroid hormone, which effects weight and metabolism.